It's almost time for the holidays + while most people are sharing their favourite gifts for the season, I thought I would take a second to share a few of my favourite brands instead! So, this week and next I'll be sharing clothing brands, beauty companies, and lifestyle stores that are my ultimate go-tos for holiday gift giving. 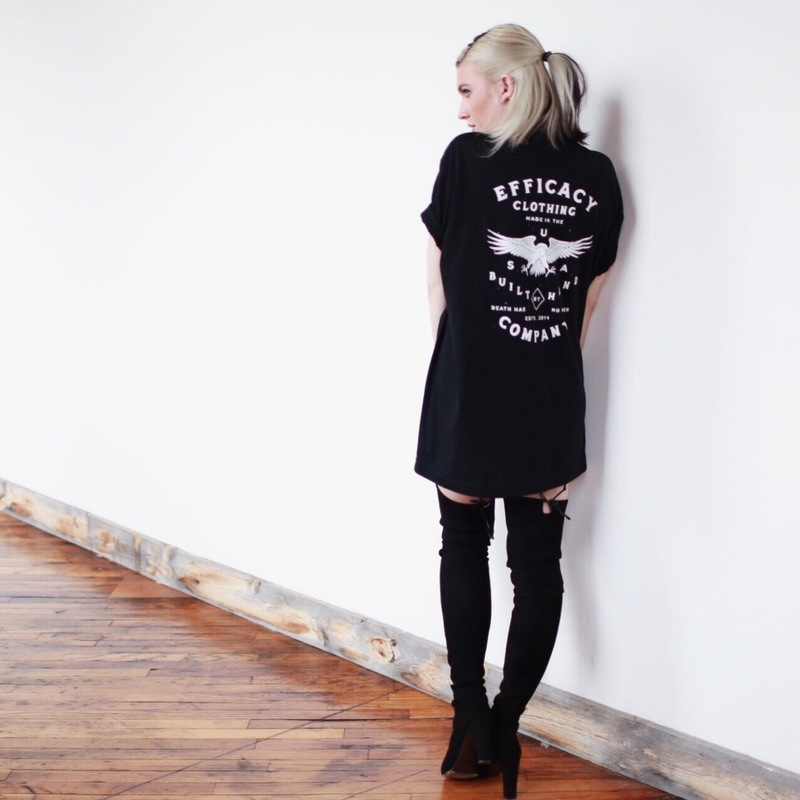 Efficacy is a clothing company that specializes in handcrafted tees guided and crafted by artisan hands. 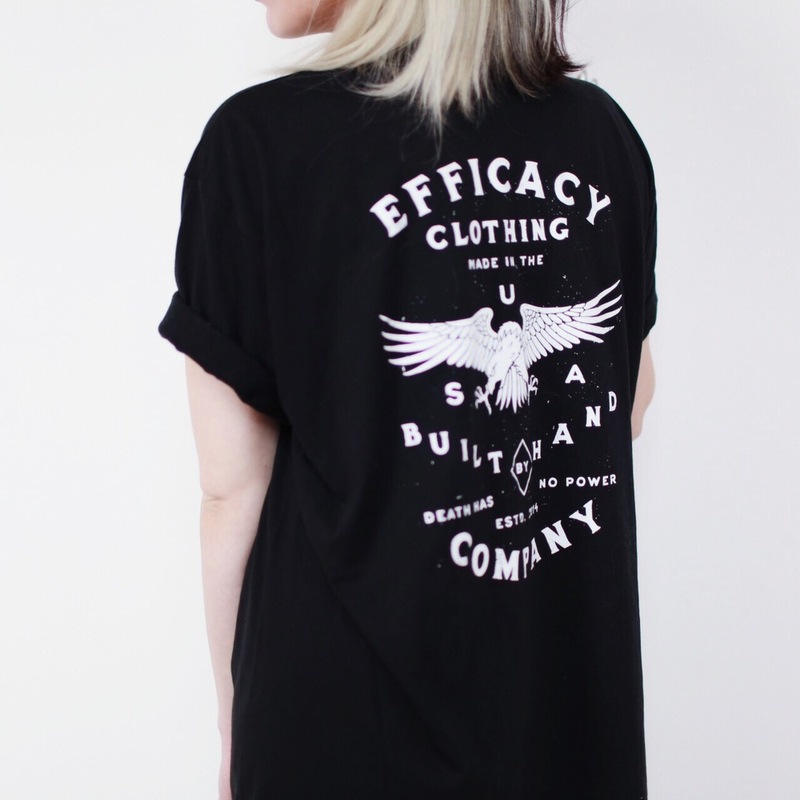 From the design concept sketches and hands that lay the ink, to the custom hand-lettered packaging upon completion, every piece of Efficacy's clothing is a one-of-a-kind handcrafted piece of art. I was lucky enough to snag three of their shirts and see for myself how absolutely incredible their craftsmanship is. I wanted to switch it up a little bit and play with wearing a larger size in the Eagle as a dress, and I'm so glad I did. This quite literal 'shirt dress' has become a must have in my closet. I slip it on whenever I'm wanting to run around town looking effortlessly cool. The prints are insane and the fact that that they're 100% American made leaves me feeling good about supporting the guys in charge. Not to mention they look killer on men and raw as hell on women. Efficacy is hands down the best place to pick up the ultimate gift for the little moto badass in your life. Wishing everyone a fantastic rest of the week, and happy gifting!